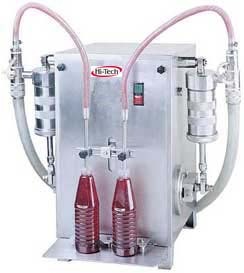 Hi-Tech Semi-Automatic Liquid Filling Machine is very simple, Piston base volumatric filler. It gives very accurate vollume with remarkable speed.It is widely use in Pharmaceutical, Chemical, Paint,Cosmetic,Oil,Softdrink,Liquir Industries. All contact parts are of S.S. 304/316 quality. Very easy to change over. ± 1 % on single dose.